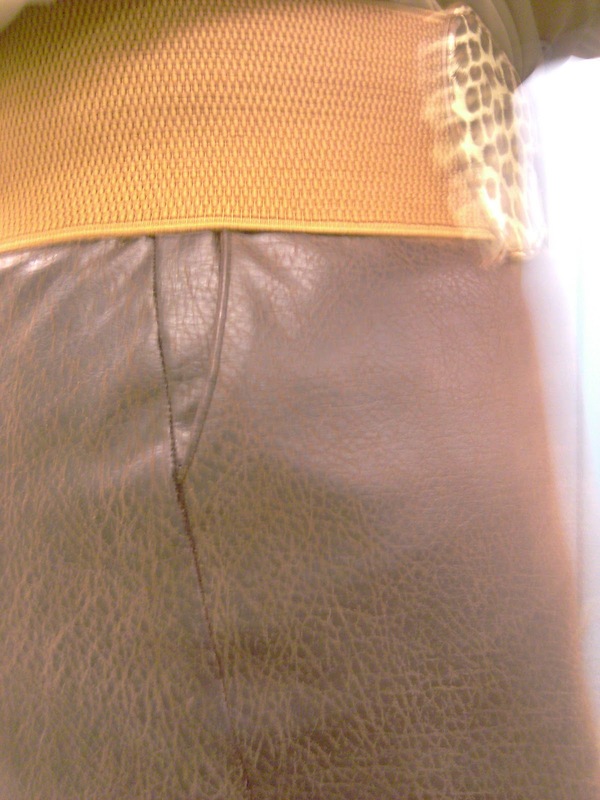 Finished my faux leather pencil skirt using New Look 6874 and the New York temps is perfect today for it and can I say Looooooooooove this skirt. I made this skirt in 2010 to pair with a jacket and honestly forgot about it. My memory was jogged when I was putting back the pattern pieces for Something is Sew Not Suitable. On another note, that wannabe suit is still around, just haven't scavengered the buttons & shoulder pads. Did Version B: Slim skirt with back darts, front pockets & back vent. The fabric is a distressed faux brown leather purchased at Walmart $7.99/yd. My plan was to sew up this abstract print for a blouse to pair with the skirt, but have yet to pick a blouse pattern for it. 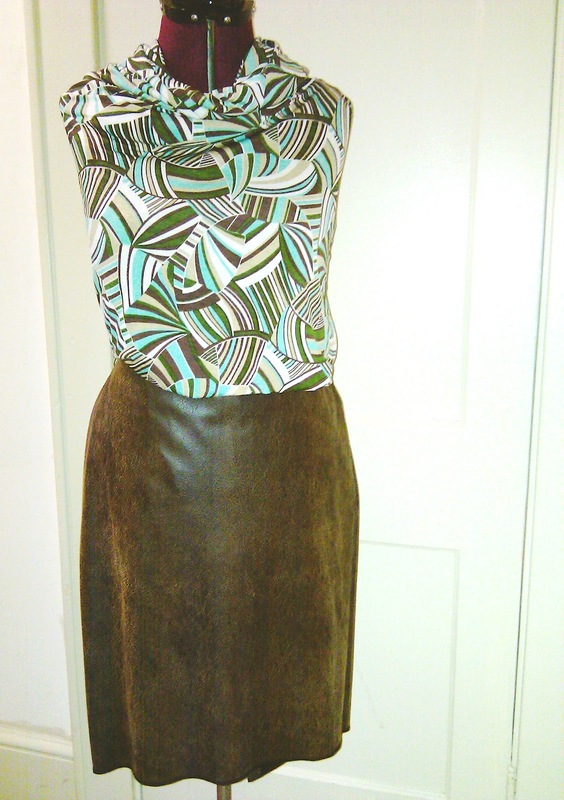 Since I have yet to sew up a blouse, I paired the skirt with an old blouse (iridescent taupe) from NYandCo. and a belt from my daughter's belt stash. Of late I have being acessorizing more and have accumulated a collection of pieces from street vendors and the Loft.... and to think this is not all of it. Ok... back to the skirt... did I tell you I Loooooooooooove this skirt. This looks great! Reminds me that I need a straight skirt, leather or not. You look so HAUTE! Yeah, you could get away with it here to weather wise. 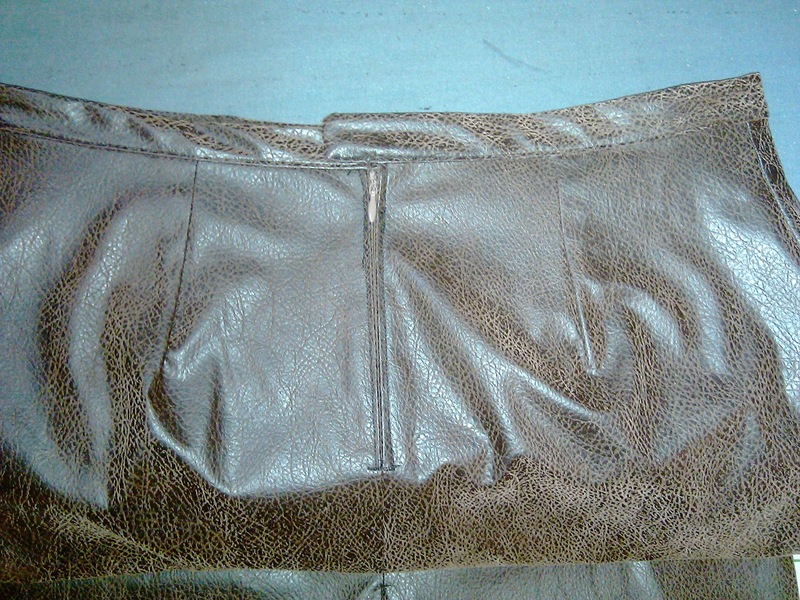 I must make me a leather skirt! Nice work! Sheila Baby! You are just runway FAB!!! Work it girl!!! You look brilliant - great work!!! You are wrokingggg it in that skirt. The entire ensemble is smokingggggg! I agree with the others - you look HOT in that outfit. I love the abstract print and my mind instantly saw it in a sleeveless, tie neck blouse of some sort. Thank you for the awesome compliments. I have a feeling this skirt pattern may become a TnT once I make a few more. Carolyn... a tie blouse would be nice. I love the skirt and I'm glad you got a chance to wear it before the weather turned warm again! You look absolutely fabulous in your skirt. Great job! You are such a cool sewer. Fabulous. Wow. You should love that skirt -- it's perfect! Love your pizzaz, Sheila! Also, love your skirt paired with the crisp white blouse and the wide bling belt -- you've made the look all your own. Grrrrrrrrl Please ! You are the baddest ! I love the skirt, top, belt, hair, sunglasses... Luv the photo of the jewelry ! What fun ! The skirt and the attitude are just perfect! As always, you look great! Love your skirt, you look great!! I also love the pic! So MOD! i love what you have done with your site! and the way you are showcasing your fashions is also great. keep it going gurl. Love the skirt. 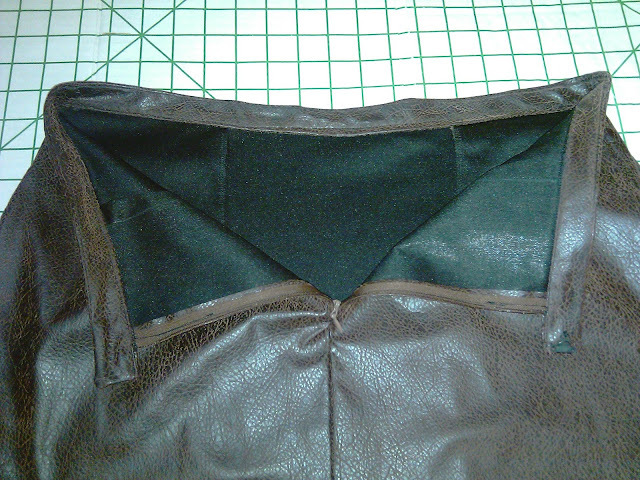 I like that faux leather too, made a couple of bags from it. Girl you are definitely working that skirt. Love it. 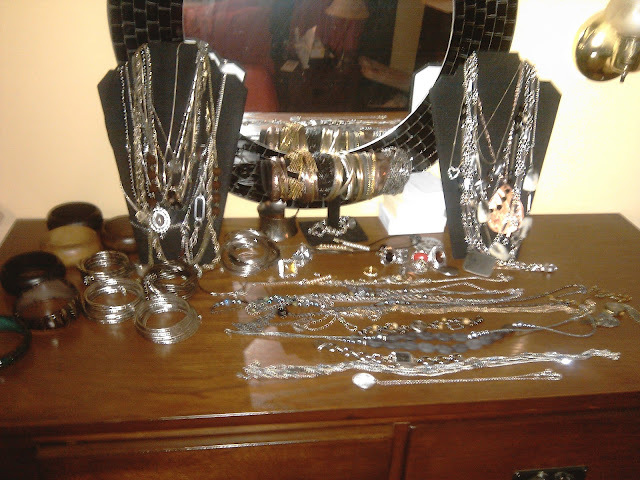 I too have been wearing more jewelry a-la-Gayle King. She's my new idol since we're in the same age decade. I watch everyday just to see what she's wearing. And she DOES load on the jewelry.